Make sure your food bar is configured to the specific needs of your business with this Vollrath adapter bar! This adapter bar is highly durable and is constructed of stainless steel which will eliminates the risk of corrosion and withstand the demands of your busy food bar. 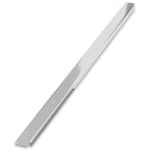 This adapter bar measures 20-15/16" x 1" x 1/4" inches so it is thin and sleek enough to blend into your food bar easily.